Destin, Florida Real Estate including Miramar Beach, Santa Rosa Beach, and Fort Walton Beach, FL properties! Please see below for more information about our listings! Cute, cute Florida patio home close to the beach! Walk to the private beach access. Tile in the living, dining, kitchen, hall, & bathrooms. New Stainless Steel appliances. Nicely furnished & move in or rental ready! 9 & 10 foot ceilings! Screened porch off the kitchen & Master. Big master bedroom! Don't miss this one! Gated neighborhood with 2 pools & a park area. 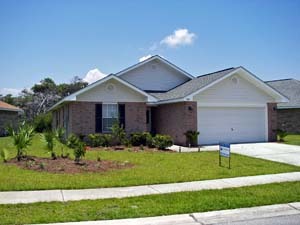 Emerald Waters Village has beautiful homes from small to quite large in a private setting. NEW A/C (Heat Pump) 8/11/2016! Dimensions should be verified if important. Nice Lake Front lot in Destiny West. No build out. You owe it to yourself to check it out! Dimensions should be verified if important. Live at the beach! Walk to deeded Beach access! Updated with all tile floors, paint, granite counters, and stainless steel appliances! This house is nice!!! 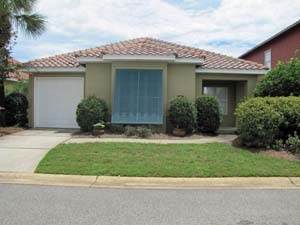 4BR/2BA all brick home in the gated neighborhood of Paradise Retreat located very close to the beach! Maintenance free brick with 2 car garage. Designer colors througout! Spacious and inviting, this home is a split 4 bedroom plan with 2 baths. The kitchen opens up to the dining area and huge great room with vaulted ceilings. The 2 car garage comes complete with a sturdy raised panel steel garage door and an electric door opener. Other features include a separate walk-in laundry room, garden tub and double vanities in Master Bath, High Efficiency Heat Pump. 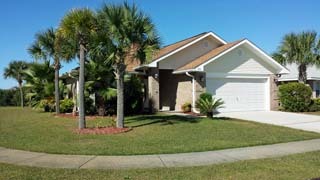 Nice, like new 4BR/2BA all brick home in Paradise Retreat. Carpet in the bedrooms and tile in the remainder of the home. Walk to our private beach access! Live at the beach! Huge kitchen open to the family room. High ceilings and plant shelves in the kitchen, dining room, and living room. Split bedroom plan with master on opposite side of house. Nice master suite with jetted tub and walk in closet. Use one bedroom as an office at the front of the house. Formal dining room and huge eat in kitchen area. 2 car garage. Corner lot with nice landscaping. Conveniently located to Eglin, Hurlburt, and everywhere in Destin! Measurements taken from tax records and should be verified if important. 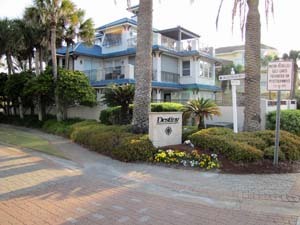 Thank you for visiting our Destin Real Estate Featured Listings page with Crystal Waters Realty. Please let us know how we can help you buy, sell, or lease Real Estate in the Destin and Miramar Beach, FL areas. We specialize in sales and rentals of residential properties such as homes, condos, and town homes on and just off Scenic 98. Let us help you with your Real Estate needs. We want to be your Realtors and value your business. Call or email us today!